Building on the success of the printed “Guide to Floyd Food,” SustainFloyd is launching a partner online guide to coincide with the first day of spring on Wednesday, March 20th! Both online and printed versions will celebrate the strength and vibrancy of Floyd County’s local food system and help connect producers and customers. The “Guide to Floyd Food” focuses on businesses that value sustainable practices and the power of promoting a strong local food system. The new online guide can be found here. 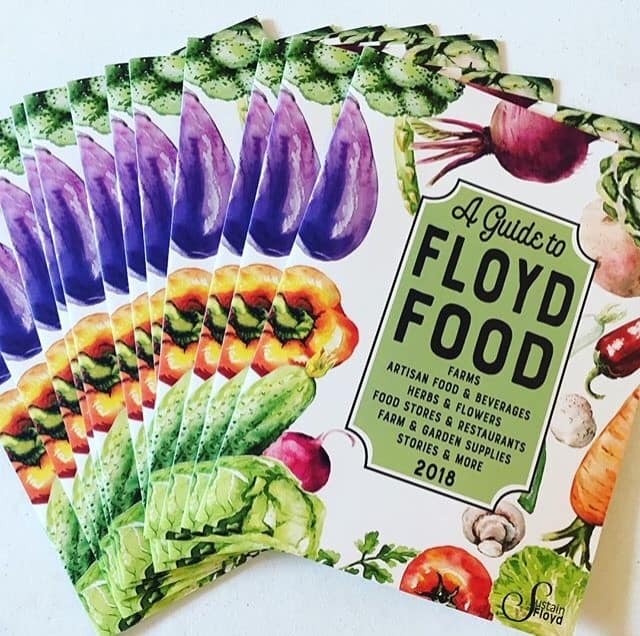 Copies of the print edition of SustainFloyd’s “Guide to Floyd Food” are available free at the SustainFloyd office in The Station at 203 S Locust St across from the Floyd Country Store or at the Floyd Tourism office at 109 E Main St. The printed guide features more than 50 local food businesses, including farms, eateries and artisan food producers, and that number has grown to more than 60 for the online guide. This growth reflects a creative and enterprising Floyd community where good local food is abundant and available. The “Guide to Floyd Food” helps customers find the wealth of food products grown, made, and sold locally. The printed and online versions of the guide are a result of the hard work of a group of committed SustainFloyd volunteers. Expenses are covered by the SustainFloyd nonprofit organization. If you want to be included in the 2019 print edition, contact us! Work on the new version has begun! Food-related businesses based in Floyd County and selling products locally are welcome to apply to be listed. The survey for potential participants is available from the SustainFloyd office (info@sustainfloyd.org). SustainFloyd is a rural non-profit in the Blue Ridge Mountains that undertakes projects to support the environment, agriculture, renewable energy, and community well-being.